Yes, we’ve previously – and not so long ago – covered El Toucan Cafe; read earlier story here. It’s unique – you can look northside, southside and (yes) even eastside, but it’s only westside you’ll find anything like it. … more people should know about it and be happy about doing so. Since our review visits, we’ve been back a couple of times. And we watch the El Toucan FB page with anticipation to see what specials are being served each week. 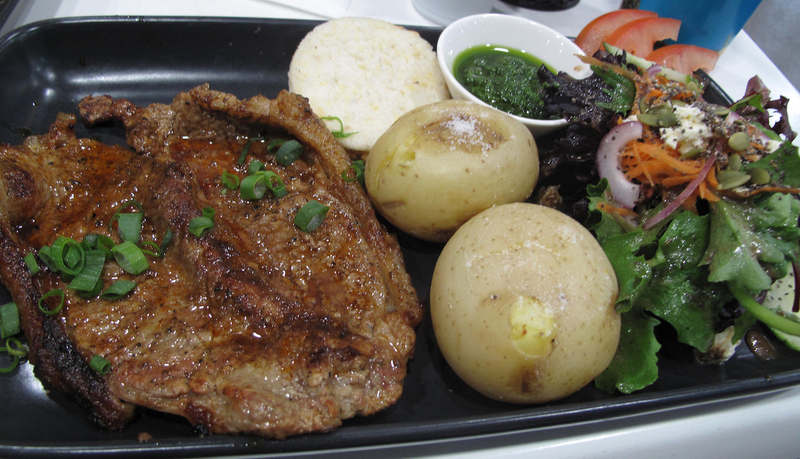 This week it was the turn of churrasco, a butterflied steak with salted potatoes, arepa, salad and chimichurri sauce ($27). The potatoes – lightly roasted, I think – are fine; as is the salad. We are not asked about rare or medium for our steaks, but it hardly matters. Flattened as they are, and done a little shy of medium, they are very tasty and tender, boasting a nice charry flavour. But the killer quotient come from the chimichurri sauce, made of parsley, oil, salt, a little vinegar and not much else. It’s a tangily perfect foil for both meat and potatoes.